That’s me right now. I have a circle of knits that I move between when I get stuck on one. 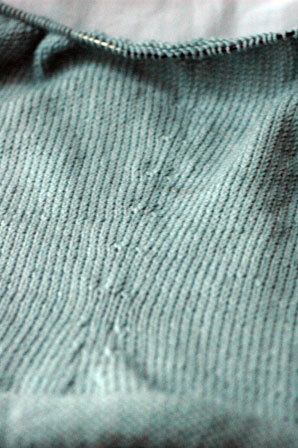 I finished the main part of the body of Green Gable and started the first sleeve a few days ago. 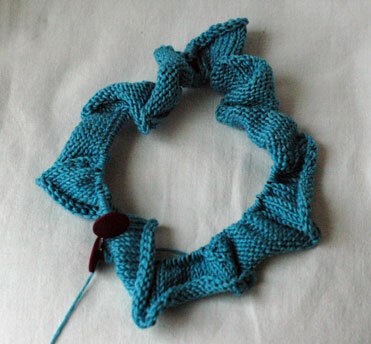 After about ten rows, it became apparent that there must be some sort of error because the cuff is huge. Bigger than my upper arm huge. I have just checked the errata and although they have corrected the chart, there is no mention of sleeves. I think I will jump down a needle size or two to get a tight-fitting cuff. In the meantime, I have been working on the next Project That Must Not Be Named. 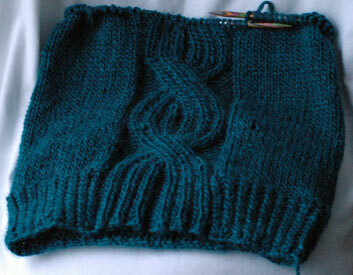 I stalled out on the start because after ten rows it became glaringly obvious that I had twisted my cast on. I managed to get over the first hurdle yesterday evening. I would love to discuss what’s happening in the texture, how it’s the first project that I have swatched endlessly for, how I still don’t know how I’ll manage the neckline and why… but I won’t. All I’ll say is that it’s one of those nice intermediate knits that isn’t too hard but has enough interest to keep you stitching away. I hope it turns out as nice as it currently looks in my head. For absolutely no reason at all, in the midst of all my other knitting, I decided I wanted to knit myself a t-shirt. Ireland is the land of the ‘t-shirt and something-else’. Sure, we have our cold snaps, but our mild days are very mild and I would like something pretty to wear on those days. Enter Cotton Fleece that just came into the shop. It’s 80% cotton, 20% merino, you get 197 metres in 100g, so I’m hoping I’ll get a t-shirt out of three skeins at the very most. It is surprisingly soft and yields a firm fabric on 4mms. I’m going to embroider some lazy daisies across the front in cream, just to give it some detail. I managed to get through a few repeats on my Bleeding Hearts. It is not the easiest chart to follow, ie, not to be worked while trying to watch something interesting! That said, I really like the width of it – neither too big nor too small – and I like the level of detail in it. It’s good for train journeys or those times when you just want to sit down and knit. It has been very cold lately so I decided to get stuck into Green Gable. It’s a hooded sweater from this winter’s Vogue Knitting. 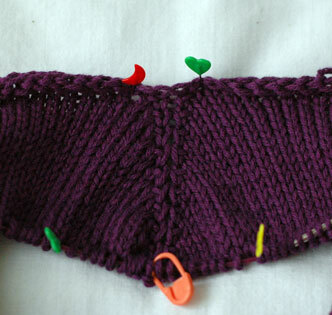 It is working up really quickly because I’m using Lamb’s Pride Bulky and 7mm needles. This is how far two skeins has gotten me. I have about five more inches of the body to do. Sleeves after that and then I get to unite them all together for the yoke and hood. I hope I get it finished up soon because although it is much milder this weekend, there is another cold snap forecast for this coming week. 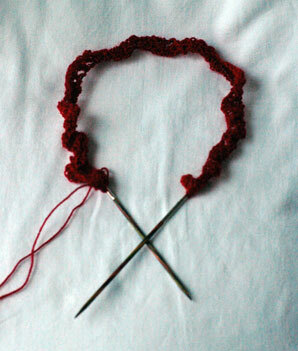 I started the Bleeding Hearts Stole but doesn’t look like anything yet! The yarn is so nice to work with, why anybody would be content to knit socks out of it and wear them on their feet is beyond me. I am disgustingly in love with the colour. TV knitting these days is this guy. It is the Skater’s Undertop from Veronik Avery’s Knitting Classic Style. This top really appealed to me for its sheer functionality. I’m using Debbie Bliss’s Baby Cashmerino which is (in my books, anyway) a heavy 4ply and perfect for this sort of thing. I think it’s a pity that the name seems to put a lot of people off, especially when it comes in a wonderful range of colours, washes well and is lovely to work with. The resulting fabric is almost velvety so to sit down with this project after being out in the cold is comfort knitting at its very best. Classes have started up again at This is Knit again – I had our first beginner’s class of 2009 yesterday and Yvonne and I will have our first beginner’s crochet class later today. It is scary how quickly the classes are getting booked up – most of our beginners classes are booked up until the end of February – so if you’ve had your eye on something, you should probably book sooner rather than later! A small flurry of activity has brought things right back to normal: trips to the supermarket to stock up again, magazine garments finished up and sent off, back to thinking about future projects. I must confess that of all the magazine garments I’ve knit so far, the last two that I sent off today have been my outstanding favourites. One was a mega quick knit and I loved it so much that I’m just going to have to make another really soon. I know it is really mean to say that because you’re going to have to wait for the pattern but I hope that it will be worth it! It’s Schaefer Anne and it has been calling my name for at least six weeks now. I said to myself, if it is still there after Christmas then it is meant to be. 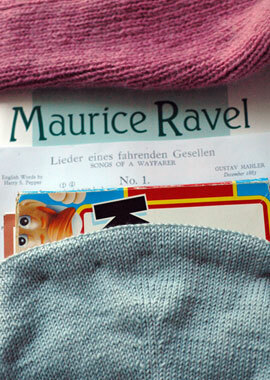 Today, having sent off all deadline knits (for now), I started looking through patterns. 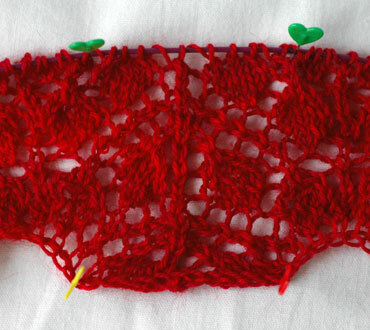 I want some lace to knit; it has been too long (two months). I’m thinking about this (ravelry link because I couldn’t find it anywhere else). 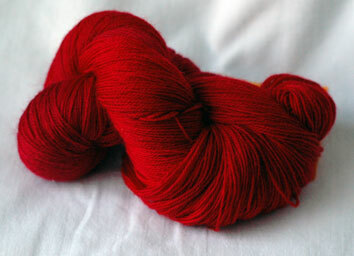 It seems appropriate, given how blood red the yarn is and how February is coming up. I have a few other ideas floating around but floaters are all they are for now. You know the kind that drift in while the kettle is coming to the boil and then float off when you need to assemble your cup of tea? Actually, a cuppa sounds like a good idea right about now. … and a happy new year to everyone else! I ended up taking a break over Christmas even though I didn’t intend to at all. There was not much knitting of note completed – a sleeve and a hem – but I took the opportunity to really get stuck into some other things. The Ravel is ‘Ma Mere L’oye’ (Mother Goose Suite), a piano duet that I will be playing in the spring with a friend. The Mahler is a set of four songs that I will be playing, among many other things, with another friend, a tenor (high male voice). They are a brilliant set of songs but not at all easy. The Rice Krispies book is a German primer to help with the translation of Mahler and other related activities. Between the sleeve (above) and the hem (below), I got a lot done. Satisfying though it may be, it doesn’t make for an interesting read so here’s something for you to think about: Verena, the German knitting magazine, is now publishing in English. I have never seen it for sale in Ireland so I was chuffed to see that they are offering a digital subscription for just $15 a year. I think it’s a great way to save a few pennies and be that bit greener at the same time! I really like Verena because they publish a really good variety of fashion, leisure and business knits, all in the one magazine.